(EN) “Okay! Good! There, to the left, a little higher, a bit more, good!” David Göttler yells up the rock face to his friend, world champion French climber Liv Sansoz. (EN) They’re just out for a relaxed afternoon of gorge climbing in Saint Gervais, a small mountain town in the French Alps. A stream babbles a few meters away from the foot of the rock wall, as they take turns driving their ice picks into the ridges and holes on the wall and pulling themselves up. The sun hazily filters down into the small ravine. 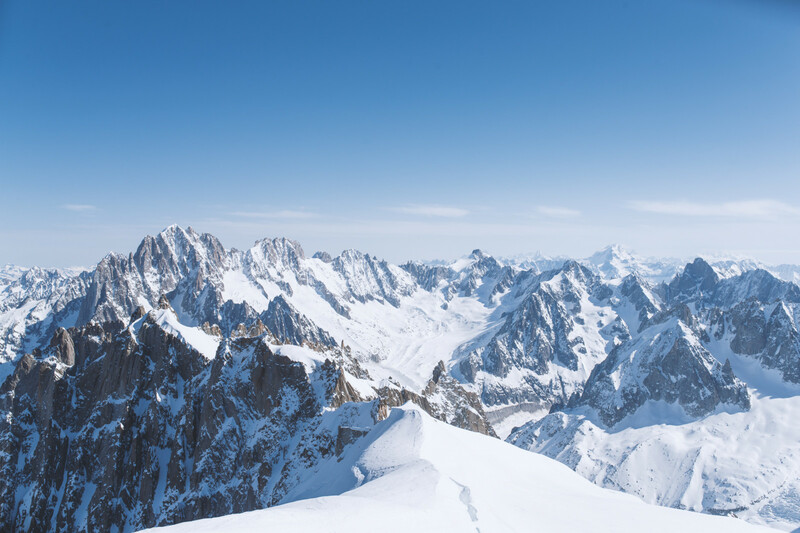 (EN) Just the day before, the 36-year old mountaineer was out with a few of his clients, hiking through the Mont Blanc massif. After taking a cable car to the summit of Aiguille du Midi, at an altitude of 3,842 meters, David strapped crampons on his feet and harnessed himself with a rope to his fellow hikers.With him in the lead, the group was quick to bypass the many skiers slowly making their way down a steep and icy incline to their starting point. One skier had already turned back, gasping for air – he was having trouble with the altitude, which can be merciless on the unacclimated. (EN) On this particular hike, David’s happy for the chance to train his body to the lower levels of oxygen. Still, it’s less than half the height of Everest, where he’s headed in just a few weeks. There he will attempt to summit the 8,848-meter mountain with only two climbing companions – no oxygen and no help from Sherpas – something only achievable by the mountaineering elite. He’s spent the last two winters with his girlfriend Monica Piris in Chamonix, one of France’s best towns for sports of all kinds. No stranger to adventure and the dangers of mountaineering, David and Monica met at the Everest basecamp, where she works as a high altitude doctor treating the very special range of illnesses that come with the territory. (EN) Born and raised in Munich, David’s childhood set the precedent for the life he now leads. He traveled the world with his family, from road trips through Iceland to climbing in Morocco with his father to trekking in the Sahara. After high school, he spent a year close to the picturesque mountain town of Garmisch-Partenkirchen, known for its incredible skiing and hiking. It was there that he discovered mountaineering. In 1999, at the age of 21 he became a member of a young alpinists team, the same team he works with now as a trainer of the next generation of alpinists. Sitting in the warm sun on the patio of a small lodge, with Mont Blanc almost in arm’s reach, we discussed his past expeditions, future plans and the complete fulfillment that comes with his job. His is a life of discipline, drive and hard-earned talent. This is the extraordinary life of David Göttler, mountaineer. (EN) What was your first real expedition? (EN) My first expedition was Patagonia in 1999 or 2000, so I was pretty young. The year after that we went to the Garwal Himalayas in India. The expedition in the Himalayas was a disaster. We went there with this completely difficult goal – but we were so motivated. From the beginning I learned that’s part of an expedition. Failure’s not a bad thing because you can get so much out of it. All my failures brought me to the next summit or helped me achieve the next goal. If I look back on all my expeditions – there have been 28 between 2000 and now – and half of them were failures in the sense that we didn’t reach the summit. (EN) As you were learning mountaineering, were there courses that you took, or was it just trial and error? (EN) My father showed me the basics in the beginning, and you come to a point where you can start to push yourself out of your comfort zone and develop the skills on your own. You read something here, or try something there, or you try to go with more experienced people, but I never had any courses. Going to Patagonia, going to the Himalayas, you just learn so much by watching what more experienced people do. I did a three-year mountaineering programcalled the DAV Exped Kader, part of the German Alpine Club, where I really boosted my skills. I don’t know if I would be here at this point in my life without this program. That’s why I’m also really happy to coach young people now. It’s so cool to show them how to not make the same mistakes you’ve made, which are out there to be made if you’re just doing it by trial and error. This is the thing, in this sport you don’t have a lot of trial and error. You need to push limits carefully if you want to live long. (EN) Sure, the first mistake you make might be your last. Is fear something that’s an issue? Do you still feel afraid sometimes? (EN) Of course, it’s a huge part of what I’m doing. When I do guide work, there shouldn’t be any fear. If there is, then I’m doing something wrong. But when I go out privately, I choose routes that I know will be a challenge, that’s the “salt in the soup.” It’s what makes it interesting. You do things that challenge you. Just last week I did a solo climb up that face there (points to an imposing wall of rock). It’s called le fil a Plomb, and you have these two pitches of steep ice, and when you’re standing below you just think, “Hmm, it looks pretty thin.” Then you really concentrate and feel like it’s going well and you get over it. Fear is something you need, because it tells you something. It checks to make sure everything is under control. The same in the Himalayas, if you go without fear, you’d mess up super fast. You’d take the wrong turn or just push too hard. On K2 I’ve been really high a couple of times, but one time I just said no and I turned around and went back. We were standing under a rocky outcrop of ice with a huge crack and we would have been hiking below it for three hours. The year before a huge part broke off and killed 11 people. It’s the worst, I didn’t summit K2, but I’m still sitting here, so I’m happy about that decision. I can live with it. (EN) Fear can be motivating, but it’s also the easiest way to end up misstepping when you’re hiking. (EN) Have you ever experienced an avalanche? (EN) When you’re in the mountains, you hear them all the time from miles away. On K2 we had one avalanche that was a huge wall of dusty snow coming towards us. Luckily, it was only snow powder, and not solids like ice. Even then, you can’t breath for a minute or two. It feels endless if you’re in it. We just grabbed onto rocks and held on as it came over us. Mother nature is really intense. It’s really crazy to hear them in the Himalayas; you suddenly have this dimension of distance, which you don’t have in Europe. 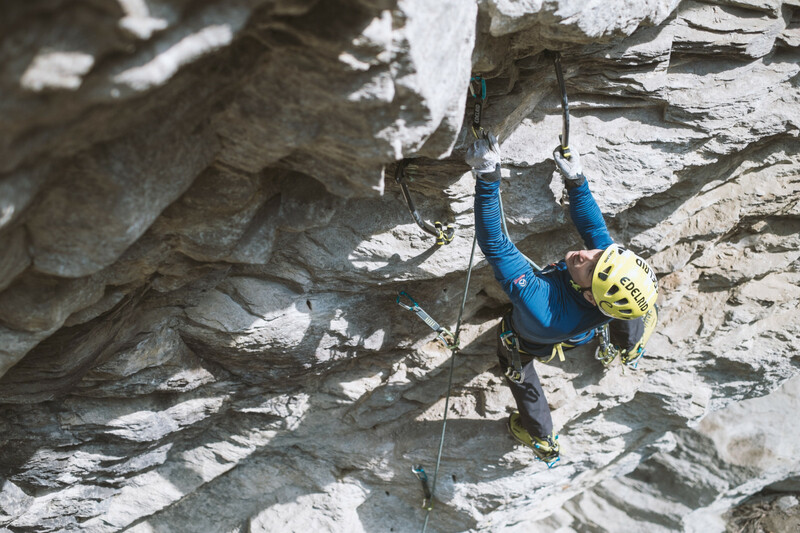 (EN) Prepping for a climb is always different, depending on where you’re going, how do you train? (EN) I do endurance training year round. I also work as a guide with Vivalpin and that’s good endurance training. I’m not pushing, but you’re out there for the whole day. It’s a basic training, which really gives you a good foundation. I go endurance running, I go climbing, I try to get acclimatized here, which is great. We’re at 3,600 meters, so it’s great to spend an hour here at that altitude. Down in the valley when the weather’s bad, we have a climbing gym, and go dry tooling outdoors, with ice tools and on rock. It’s really steep, so it’s good for your arms. I spend my summers in Spain, and it’s the same, I’ll go rock climbing, do lots of cycling for endurance training. (EN) Endurance must be a huge part of it. What’s the longest you’ve hiked on an expedition? (EN) It depends on the mountain. On K2, for example, we tried doing it in a single push, so we went from basecamp to 5,500 meters to 8,000 meters, and there we turned around because we couldn’t make it higher. That was 2,500 meters over 26 hours. Normally, it’s maximum of 1000 meters from camp to camp. (EN) It seems like you’re really moving around for your adventures. Two months here, a few months there. Is the idea of home important to you? (EN) I definitely need a home in the long run. Somewhere I start and go back to, even if I’m not there very often. I need a place where I know all my gear is, where I can start and repack and fuel up on energy and in my mind. I don’t think I’m the type of person who could just live out of a van, always traveling around. I can just inhale all these different cultures and places, I really love that, but I still need more than just a van that I live out of. (EN) You don’t climb with supplemental oxygen, which is rare. Why? (EN) For me, it’s a rule that I don’t climb 8,000-meter peaks with oxygen. I see it as cheating. This is a key issue that makes Everest so special – that it doesn’t have so much oxygen. It’s part of the difficulties the mountain offers you, that’s why you go there. If I were to use oxygen, it feels like I’m taking something away from the experience. From a sport-driven perspective, that’s my motivation. What does it feel like there without oxygen? Can I handle the altitude? The mountain itself is beautiful. It’s challenging for sure. (EN) When you do expeditions, how do you decide who goes with you? (EN) You definitely need to choose who you end up with carefully. Most of the time you have an idea for a route, and then you think about who could be a good partner. For the high mountains, there are a limited number of people to choose from. On the one hand it’s about technical experience, but it’s also about being able to handle the altitude. You need good climbers who won’t struggle at 6,000 meters. Then, you also spend two months with them, so there has to be a personal connection. Otherwise you just get annoyed, and that’ll be the end of the expedition. It’s not like you’re in a place where you can really escape, in this intense environment and doing this intense climbing out of your comfort zone. It needs to work from a personal perspective. (EN) When you’re in the Himalayas, is it warm like it is here? (EN) The difference is crazy. I remember one time we were there in our tents just in our underwear and feeling like we were at a barbecue. I think it was 35+ degrees Celsius. Then, five minutes later when the sun disappeared, it was -15. Even if you held your hand in the sun, the one side gets really warm, the other side is cold. The sun itself is strong, because it’s so high up, but the air is still cold. (EN) Since you’ve started, how have you seen equipment change? (EN) It’s changed massively, especially in the field of electronics. On one of the first expeditions we had a satellite phone that we could only use to send super short messages. It was huge, the size of a suitcase, and incredibly expensive and slow – really just for emergencies. Last winter, in Nanga Parbat, we had a flat rate. You have a box that’s maybe the size of a thick book, and it connects to the satellite and you sit there and just text and Skype and WhatsApp. Now the satellite phone is the size of an iPhone. It’s crazy, it’s the same with cameras. On my first expedition we had analog film! (EN) After a day of sun and hiking, there was only one thought on everyone’s mind: food. Luckily, David and Monica have a few favorites around town, including Le Petit Kitchen. There we sit down, while David tells us about what he has coming up. He recommends the pita with cumin spiced roasted vegetables with mint yogurt, feta cheese and salad, or the warm beetroot salad with goat cheese, cherry tomatoes and toasted seeds, but the entire menu sets our stomachs rumbling. (EN) Do you have a favorite piece of equipment? (EN) For me, it’s the Himalayan Suit. You put it on and you feel like Superman, like you’re indestructible. It’s not for everyone, you wouldn’t wear it in a city. What I also really like are these light things that you always have with you, like the vests. Thermoball is a new thing too, which is great for insulation. (EN) I’m sure there are plenty of routes that haven’t been explored yet, and maybe that will change as equipment develops. Do you think there are still places in the world that are unexplored? (EN) Of course! The 8,000-meter peaks are explored in the sense that we know what they look like, and we know what all the faces look like, but even there we still have entire faces that have only been tried once, or only one route and the rest is all unexplored terrain. It could be that it’s too dangerous or not possible. If you go lower to 6 or 5,000-meter peaks, they’re massively unexplored. We’re going to Kyrgyzstan in the autumn and it’s such a huge mountain range, and there’s so much potential. In Sichuan, you look to the horizon and say, “Woah, what’s that and what’s that?” Nobody has gone there. I think there are so many places, just not the big famous ones. There won’t be any more Reinhold Messners, doing that kind of unexplored terrain and becoming famous, but there is so much still out there. (EN) You’re headed back to Everest soon, what will that be like? (EN) I’m going to the north side with two friends in the spring. We’ll try to summit without oxygen or Sherpas. On the north side you can be absolutely independent. There are no icefalls where you need the work of the icefall doctors, who put their ladders in and make it climbable. Our plan is to try to do a variation on the normal route. Everything has to be perfect, the conditions, how we feel. Even in the last few years, the conditions on the mountains have changed so much. It’s so dry. There’s a chance that we’ll end up on the normal route in the end, because so much depends on the conditions. But we’ll see. (EN) Does it involve a lot of sending maps back and forth? (EN) Yeah, the original plan of the route comes from two friends. One is Gerfried Goeschl, an Austrian. He died on a winter attempt in the Karakorums, but he had this plan with another friend Louis Rousso, and he asked me to go. In the end it turned out that Louis was not able to come, but he’s fine with that. (EN) What do you do in your downtime at the camp? (EN) Read, Skype and e-mail, sometimes you write a little bit. You talk about past adventures and coming adventures. Life and home. You have your three meals a day. You sleep a lot. The altitude itself means that you can sleep way more. I started to do yoga a couple of years ago. It’s something I can do on expeditions, so it’s really nice to do a yoga session a day if the weather is okay and the altitude isn’t too high. (EN) Are there any rituals that you have when you’re trekking? (EN) We never start the climb from basecamp if we don’t have a Puja – a Buddhist ceremony that the Sherpas do. It’s something I really trust in. I’d just feel uncomfortable if we don’t do it. Then you have mandalas. I keep it in my house now, but when I go on expeditions I wear it the whole time. On Everest they say a special mantra before they go through the Ice Fall. I learned it as well. You develop a similar approach to the mountains that the Sherpas have. For example, they believe the summit is where god lives, so it’s absolutely a no-go to step on the summit, so you stop a meter before, but they really appreciate if you do this everywhere, on all the mountains – just this last meter, which is absolutely fine for me. I respect the local beliefs everywhere. For example, when I’m in Pakistan, I try to adopt their ideas and take part in what they do. At Nanga Parbat, we went into this small mosque with the crew and with the staff; it was super nice to join. (EN) Do you pass bodies on Everest? (EN) Yes, on 8,000-meter peaks, it happens sometimes that you pass dead bodies, and you just have to leave them and keep going. Sometimes it’s really strange. There’s one ascent, where you have to take the right way up, otherwise you’ll miss the summit, and at one point you reach a plateau – if you pass a body it means that you’re going the right way. It’s crazy, but with these accidents, it’s part of mountaineering. You want to know what happened, and you analyze it, and you try to understand what mistakes were made to avoid them. Of course, mountaineers are good at pushing away negative experiences and focusing on the positive. (EN) What areas do you like for trekking in Nepal around Everest? (EN) I still really love the whole Khumbu region for trekking; it’s the easiest one. Others like the Makalu region or the Kanchenjunga regions are super nice and pretty, but they’re way more remote and you need to bring tents. Which means that it starts to get a bit more difficult. Or the Rolwaling Trek where you end up in the Khumbu. Khumbu is kind of busy, but when you go late in the year, in November, it’s perfect. There are still a few trekkers. You have this incredible infrastructure, so you don’t need tents, just a light sleeping bag for the lodges, you can stop wherever you want. You can have super long days, super short days, whatever you feel from the altitude or the weather. It’s so easy, it’s like going from hut to hut. The lodges are affordable. You have super iconic mountains, you can see Everest, and you can go to the Everest base camp. There are 5,000-meter trekking peaks where you can go with your normal trekking things. You don’t need porters, you don’t need guides. You don’t need anything. (EN) Was there ever any other option as far as your career goes? (EN) It’s hard to say. Sailing is something I really love but have almost never done before in my life. Sometimes I thought maybe I could become a sailor. 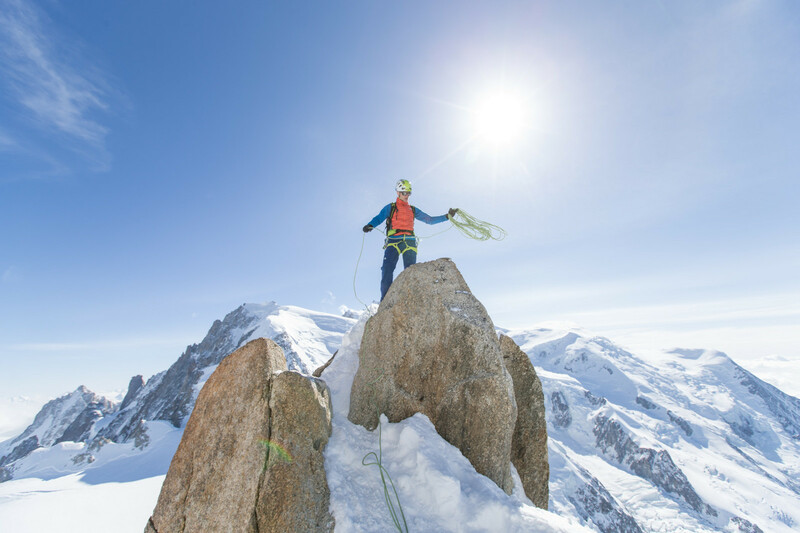 (EN) What’s your advice for someone who’s just getting into mountaineering? (EN) If you want to try something more challenging, and you don’t have the confidence, just go with a guide. It’s so much safer. You can really explore terrain and have adventures, which you couldn’t do without a guide. If you go on your own, you should just be brave and explore your limits. Take a right where you normally take a left, you’ll end up somewhere totally new. (EN) Thank you David, for an unforgettable few days in your life of adventure! We wish you all the best for your upcoming Everest climb. This portrait was developed in collaboration with The North Face. To find out more about David, and to follow his adventures on Everest in real time, you can find him on Facebook or check out his website.